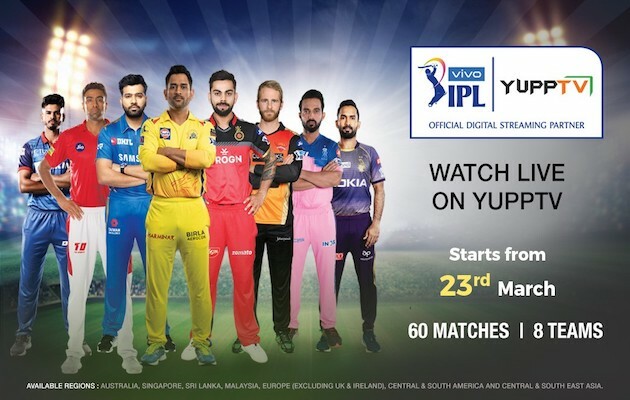 "YuppTV bags the digital broadcast rights for VIVO IPL 2019 for Australia, Continental Europe, and South East Asia". Commenting on the announcement, Mr. Uday Reddy, Founder & CEO, YuppTV, said, "We are glad to acquire the digital broadcasting rights for the IPL 2019 and would be enabling on-the-go-access to all the action unfolding in the Season 12 of IPL. We are determined to provide our global audience with convenient and real-time access to their favorite sporting action, through a wide gamut of internet-enabled devices." YuppTV is one of the world's largest internet-based TV and On-demand service provider for South Asian content, offering more than 200 TV channels and 2000+ movies in India.